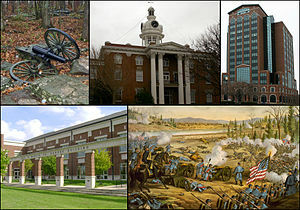 From top left, cannon at Stones River National Battlefield, Rutherford County Courthouse, City Center, MTSU 's Paul W. Martin Sr. Honors Building, Battle of Stones River. نعرہ: Creating a better quality of life.